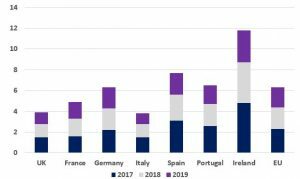 Last week, the European Commission’s forecasts suggested that the recovery in the single currency area is not just established but accelerating. Economic output in 2017 is set to expand at its fastest pace in a decade with real gross domestic product (GDP) growth forecast at 2.2%. This is substantially higher than the 1.7% expected in spring. The wider European Union economy, as a whole, is also set to beat expectations with robust growth of 2.3% this year (up from 1.9% in the spring forecast). 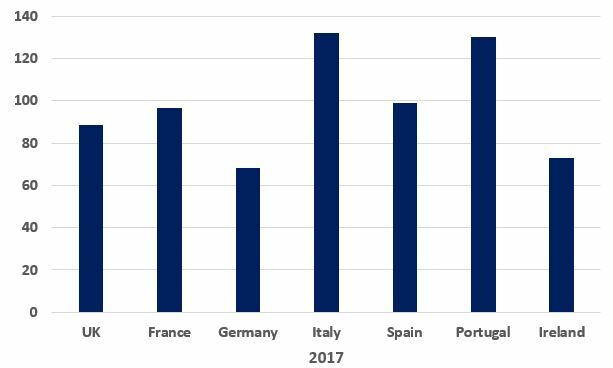 Germany‘s growth is underpinning the recovery, but some of the highest projected growth rates are in countries on the periphery such as Spain, Portugal and Ireland. Even laggards like Italy are growing with their economy expected to expand by 1.5% in 2017 and 1.3% in 2018. The turnaround underway has been encouraged by the European Central Bank’s (ECB) stimulus policies and efforts by nation governments to introduce country specific fiscal recovery programmes. However, despite stronger growth and falling unemployment, forecasts show that the euro-zone recovery is far from complete. Wage inflation remains low and the Commission expects inflation still to be well below the ECB’s 2% target in 2019. While the improvement in the overall landscape is striking, so is the dispersion in employment conditions between the strongest and weakest members. This is a key factor influencing political change and so called populist movements. In Germany, unemployment is expected to fall to 3.2% by 2019, whereas in Spain, Italy and Greece unemployment remains in double digits. Meanwhile, interest rates remain at historic lows and the economic recovery is well on track. 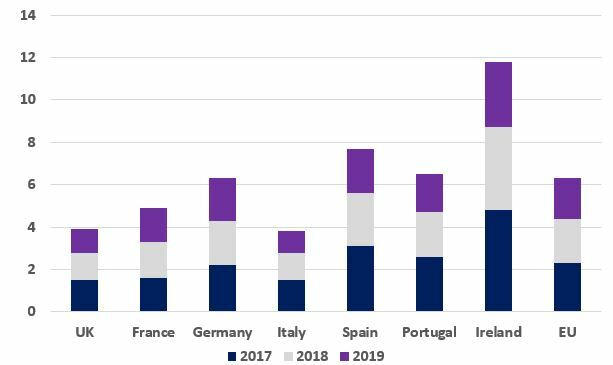 However, the most indebted countries (shown below in terms of the ratio of gross debt to GDP) still have more work to do to avoid being vulnerable to an unexpected downturn or a rise in interest rates not currently forecast. Europe has come far but there’s still much further to go. The cyclical upswing is a welcome development as Brexit negotiations unfold as better growth across Europe puts less pressure on future budgetary plans. Last week, US President Donald Trump, celebrated the anniversary of his election. Amongst his promises was tax reform. Even though Republicans are making some progress, proposing to cut taxes by $1.5 trillion over the 10 years, there are still challenges to put the reform into action. A Bill that will cut the corporate tax rate from the current rate of 35% to 20% needs the approval of both chambers, the US Senate and the House. If the final tax Bill is passed by each chamber, which also includes individual tax reforms, it should boost income and spending in the short-term. This is intended to stimulate economic growth to at least 2.5% in 2018. With companies getting some relief from lower taxes, analysts are expecting higher wages and lower unemployment to start to pass through and the Federal Reserve will monitor this as part of their interest rate setting deliberations. The challenge to achieve tax reform via a Bill is finding an acceptable source of revenue to support the cuts in taxes to allow the government to meet fiscal targets and avoid further increasing US budget deficits and national debt. Repeal of the Obamacare mandate is projected to save $318 billion over the decade but could lead to 13 million Americans losing their healthcare coverage and push insurance premiums up by about 10%, according to the Congressional Budget Office. Some Republicans point out that adding healthcare into tax reform moves away from the true purpose of tax reform as it will negatively affect middle income households. In addition, Senator Ron Johnson noted that the tax reforms favour large corporations over small businesses that “truly are the engines of innovation and job creation”. The House passed their version of tax reform yesterday (Thursday) with 227 Republican votes. The focus is now shifting to the Senate to see whether Senators can agree on their tax overhaul before both chambers agree on the final Bill. Even though the ambition is to pass the Bill before the end of the year some expect the bickering to drag on to the 2018 mid-term elections. 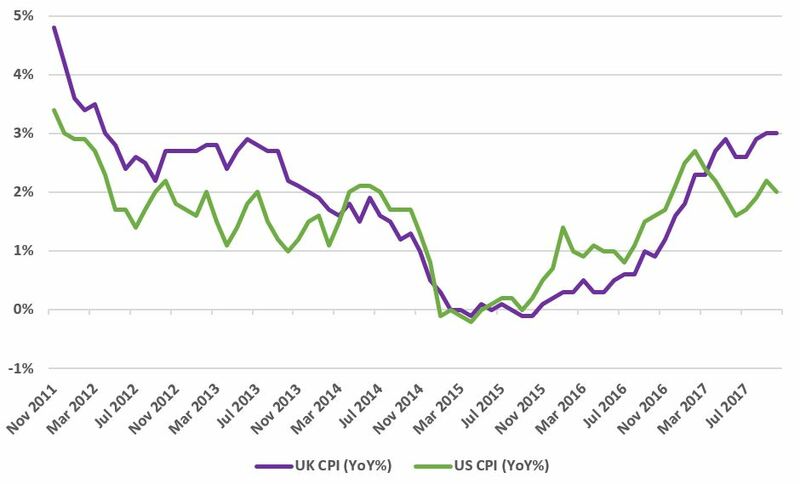 The UK headline inflation Consumer Price Index (CPI) remained unchanged at 3.0% despite analysts forecasting inflation marginally higher at 3.1%. 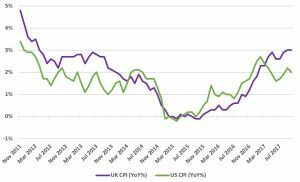 Looking across the Atlantic, US Inflation has slowed to 2.0% over the year from the previous month’s figure of 2.2%, despite the unexpected 2.8% increase in producer prices revealed through the release of PPI index data. One of the issues stopping US inflation rising is the low labour participation rate with a high number of people eligible for work but not registering as unemployed. This restrains incomes and spending. Policy makers are looking for ways to increase labour participation, meanwhile the falling pace of inflation reduces pressure for the Federal Reserve to increase interest rates further. Finally, rising crude oil prices last month will start to be reflected at the pumps in the UK. Therefore, higher fuel prices are likely to be reflected in next month’s CPI headline figure. The main contributors to the inflation series in the UK are rising food prices and the price of recreational goods such as packaged holidays and books, which are the biggest contributors to the five-year high figure. Despite the challenges presented by inflation, the Governor of the Bank of England and members of the interest rate setting policy committee intend keeping interest rates at very low levels well into next year.